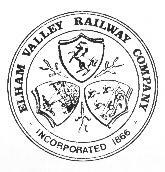 The Elham Valley Railway Company, aimed at connecting the South Eastern Railway's Folkestone and Canterbury stations, arose out of rivalry between the two main railways in Kent, the SER and the London Chatham and Dover. To thwart LCDR expansion into what they regarded as their territory, the SER was forced to adopt the moribund EVR proposals and build the line itself. Work began on Thursday, 28 August 1884 following a lavish ceremony at Newington, near Folkestone. The line was built in two stages, with the lower section from the main line at Cheriton to Barham being completed by 4 July 1887 and a passenger service initiated between Shorncliffe and Barham, with six trains in either direction on weekdays and three on Sundays. The upper section was delayed by wrangling over the purchase of the necessary land and the requirement of the owner of Bourne Park for a tunnel beneath his land because he did not wish the view from his mansion to be spoiled. The section also required much more substantial earthworks, with a series of deep cuttings and high embankments on the approaches to Canterbury as well as a massive bridge across the River Stour. Consequently it was not until 1 July 1889 that trains were able to operate the full length of the line, and even some of the work awaited completion. On 25 June 1891 the SER officially absorbed the EVR. Stations were built at Lyminge, Elham, Barham, Bishopsbourne, Bridge and South Canterbury, the latter near the St Lawrence Hospital and not far from the Kent County cricket ground. 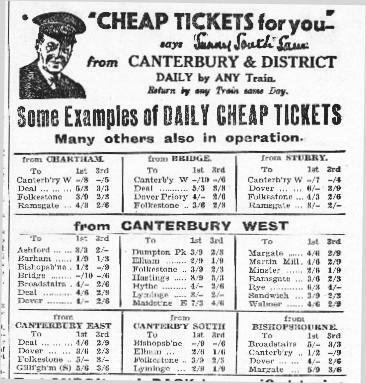 Services ran between Folkestone and the SER station at Canterbury (renamed Canterbury West after the amalgamation of the SER and LCDR in 1899 to differentiate it from the LCDR's station, which became Canterbury East). In 1908 a new wooden platformed halt was added on the mainline at Cheriton, which was only served by Elham Valley trains. The line enjoyed a comfortable if undramatic existence until the outbreak of World War I in 1914, the change to the South Eastern and Chatham Railway in 1899 making little or no difference save for the appearance of the the occasional LCDR engine at the head of trains. When war came in August 1914, the strategic importance of the SECR was recognised at the outset and posters were immediately displayed at all stations informing the public that the railway had been taken over by the government for the duration. For four years civilian passengers and freight took second place to troop movements through the Channel ports of Dover and Folkestone, the demands being such that at one time the SECR seriously considered abandoning all pulic services. The Elham Valley line proved a useful alternative route, but really came into its own when the mainline between Folkestone and Dover was blocked by a landslide on 19 December 1915. The line remained closed until 1919. As a consequence temporrary single line working was introduced through the Elham Valley, with the other track used to store munitions wagons. When the war ended, normal services resumed again but were now faced with competition from buses. In 1923 the SECR became part of the Southern Railway and began a systematic review of all the railways under its control. In 1931 the whole of the line was made into a single track, all the signal boxes removed except for Lyminge, and the staffing greatly reduced. The Barham signal box survives to this day because it was purchased by a local garage, Arter Brothers, and used as a store shed. The Lyminge signalbox was taken out in 1937 and replaced with a small ground frame, operated by the porter on duty. Just prior to the outbreak of the Second World War in 1939, all the stations on the line were extensively renovated. After the debacle in France that led to the Dunkirk evacuation, the whole of Kent come under the threat of imminent invasion. Accordingly, in 1940 passenger services were suspended north of Lyminge and the line from Elham to Canterbury was handed over to the military. Two 9.2 inch railway guns of Y Battery of the Canadian Royal Artillery were initially stationed at Elham, replaced by two 12 inch railway guns of 7th battery, 2nd Super Heavy Regiment of the Royal Artillery. HMG "Boche Buster" and 18 inch railway gun belonging to 11th Battery, 2 S.H.R. was stationed at Bishopsbourne. A spur was constructed into a field at Kingston, so that "Boche Buster" could be traversed to fire eastwards towards the Sandwich coastal area. In 1942, 8th Battery, 2.S.H.R. replaced 7th Battery at Elham. Two more 12 inch guns from 13th Battery, 3 S.H.R. arrived at Lyminge in 1943. The military operated some excursion trains on which locals could ride. Others took the opportunity for unofficial rides. On one of them, a nine year old boy, Micky Brett, was killed, together with the fireman, when the train he was on was strafed by a German aeroplane. During 1943 the line was also used to train military personnel in railway operation. Just before the D-Day invasion of Normandy in 1944 the Elham Valley line was handed back to the Southern Railway and early the following year, freight services were reinstated throughout its length. The Folkestone - Lyminge shuttle was likewise reintroduced but the end was very near. On 16 June 1947 all train services were withdrawn and the line closed. Track removal began shortly afterwards. Apart from the embankments and cuttings there is still much to see of the line. The station buildings at Bridge and Bishopsbourne survive, with their platforms relatively intact, both as private dwellings. Lyminge, after a period as a council storage depot and offices, is now restored and serves as the village library. Bourne Park Tunnel is used as a store by a local farmer and several of the bridges are relatively intact, with abutments of a few others still to be found. Further reading: The Elham Valley Line 1887-1947 by Brian Hart, Wild Swan Publications 1984, ISBN: 0 906867 22 3.